Jupiter's moons cast shadows on the planet's disk when they pass in front of Jupiter. On rare occasions, the shadows of two moons fall on the planet at the same time. 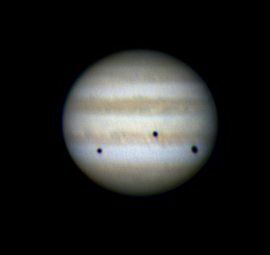 This image shows an even rarer event - three jovian moons simultaneously cast their shadows on the planet's disk. 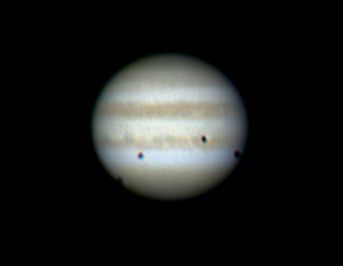 Just before Callisto's shadow left Jupiter's disk, Ganymede's shadow began a transit, and for the next nineteen minutes we were treated to the unusual sight of a triple shadow transit. In this image, the shadow of Callisto is on the lower left. Ganymede is transiting and appears as the shadow above and to the right of Callisto's shadow. Jupiter's moon Io cast its shadow as the dark spot to the right of center. Io is transiting Jupiter, but blends in with the cloud belts and cannot be seen in this image. Ganymede's shadow is visible as the dark spot on the far right. The moon Europa was hidden behind Jupiter during this event. The night of March 27-28 offered a good opportunity to observe planets, because all five naked eye planets were visible in the evening sky. Mercury was low in the west, followed by Venus, Mars, Saturn and, of course, Jupiter. On the day this image was taken, Jupiter was 99.8 percent illuminated and magnitude -2.45. This image was published in the April 2, 2004 issue of the Astronomy Magazine Newsletter. The image was obtained using a ToUcam Pro web cam on a Takahashi FCT-150 telescope with a TeleVue 4x PowerMate operating at f28. My images were taken at the summit of Kitt Peak, Arizona. Special thanks to Adam Block for making it possible for me to image from Kitt Peak. 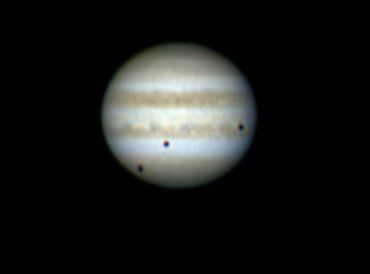 The images below show Jupiter immadiately before the triple shadow transit, and immediately after the triple shadow transit. Ganeymede appears so dark against the disk of Jupiter that it appear as though it is a shadow. In the three images shown on this web page, the shadows and moons were transiting from right to left. RA: 10h 52m 07.2s Dec: +08d 45' 01"